Americans love a good story. Pop culture is littered with the fictional tales of heroic characters. The majority of stories today still follow a three-act structure that dates back to Aristotle. Epic films start with the hero called to action in the first act; then the tension rises in the second (how will our hero get out of this situation? ); and finally, in the third act, a resolution. By the end, the hero will have achieved his victory (normally) but he will also be changed in some fundamental way before the story is over. Unfortunately for us, reality has followed this structure in the Iraq War. With the 14th anniversary of the invasion of Iraq upon us, we must recognize that the Iraq War of 2003 was not an isolated event but merely the second act of a war in three parts. The first act was the call to action in 1991: Saddam Hussein was an international villain who demanded the attention of good and freedom-loving people. The hero, America, rose to the challenge in Operation Desert Storm. But, contrary to popular belief, the war didn’t end in 1991. The United States and Great Britain maintained a strict no-fly zone throughout the remainder of the decade. The hero and the villain merely continued battling during this period. In a way, then, the resolution of the Gulf War in 1991 was more akin to the peace deal at the end of World War I in that it was little more than a protracted armistice. This set the stage for the second act in 2003. Per the three-act formula, the stakes were raised in Act Two. 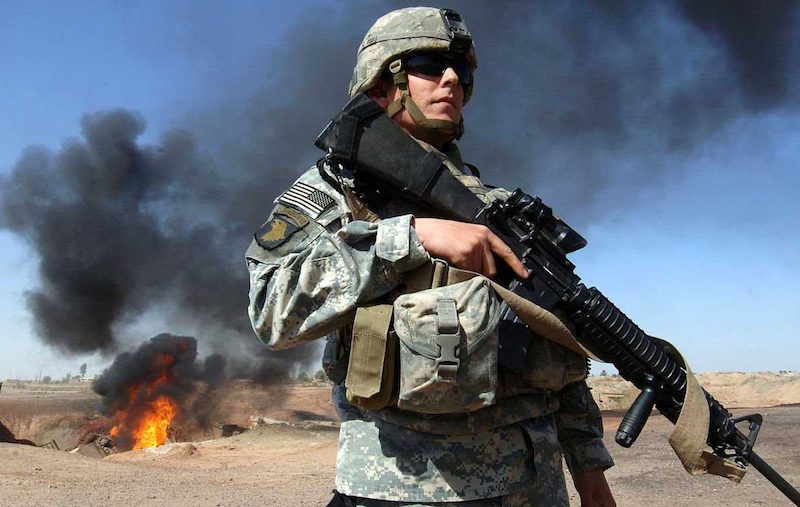 The world wondered how on Earth would America get itself out of Iraq? The conflict, as George Friedman (channeling Shakespeare) claimed in his 2005 book America’s Secret War, was a tale “told by an idiot, full of sound and fury, signifying nothing.” And, like Shakespearean tales, the only thing that determined whether the story was to be a tragedy or a comedy, was whether or not the story ended with a marriage. Make no mistake: there’s nothing funny about war (and, to be fair, most Shakespearean “comedies” are not funny in the sense that we understand “comedy” today). However, there is something perversely humorous behind the political class and its telling of this three-act war. Remember, the United States invaded Iraq to prevent a genocidal madman from acquiring nuclear arms and destabilizing the Mideast. America also wanted to prevent both Iran and Sunni jihadists from exerting influence there after Saddam was toppled. Yet—and here’s the darkly humorous part—by invading Iraq, America’s political elite likely set into motion the very outcome they sought to avoid. In the end, Saddam did not have nuclear arms (though, to be sure, he made everyone think he did). And with Saddam’s ouster, al Qaeda (and later ISIS) gained significant amounts of influence in Iraq. Meanwhile, Iran has steadily increased its control over Iraq. CLICK HERE to finish reading the piece over at American Greatness!